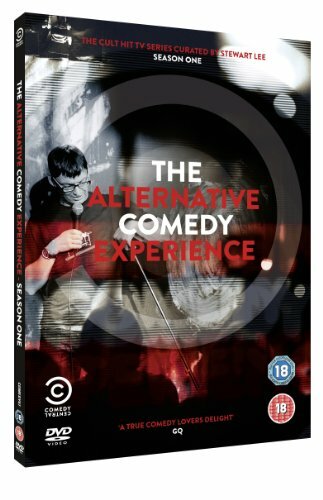 The Alternative Comedy Experience On DVD Now! Series One of The Alternative Comedy Experience – featuring a smattering of TVO regulars and wider universe friends – is now available on dvd. The twelve part series, which aired on Comedy Central earlier this year, was curated by stand-up legend Stewart Lee, who is currently wowing audiences attending his residency at Leicester Square Theatre with his new material try-out show, Much A-Stew About Nothing ahead of the third series of his own Comedy Vehicle series on BBC2. Filmed at The Stand, Edinburgh, Lee chose some of his favourite stand-ups on the circuit, including our very own Tony Law and Paul Foot, alongside a few names that have occasionally cropped up on our pages before now, such as Isy Suttie, Simon Munnery, David O’Doherty, Phil Nichol, Bridget Christie and Glenn Wool. It’s a truly fantastic run of comedians in their prime, and with all twelve episodes spread across two discs, there’s also room for a couple of uncut, full length performances and bonus interviews. There’s even a full colour souvenir brochure thrown in for good measure. You can own a copy for yourselves for just £12.78 now via The Velvet Onion Amazon UK Store. You can see a preview from the dvd featuring Tony Law below. Series 2 of The Alternative Comedy Experience was filmed this summer, again at The Stand, and will be broadcast in the new year. Paul Foot and Tony Law returned, alongside Isy Suttie, Susan Calman, Simon Munnery and Henning Wehn, so stay tuned for transmission dates as soon as we have them.